As lake levels go down, the pressure on government to “do something” goes up. That’s a predictable response, and it’s also a bit frightening. “First, do no harm” may be a guiding principle in emergency medicine, but it has yet to catch on with the political class. Emergency dredging projects should salvage the boating season for many of Michigan's public harbors, but this summer could still prove frustrating for those who use and operate certain marinas. Boaters should be on the lookout for large trees, logs and other debris let loose into Michigan waterways in part by spring flooding, the U.S. Coast Guard has warned. We're back with Vol. 2, Ep. 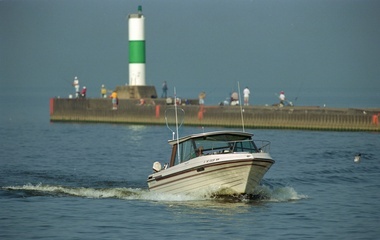 2 of our weekly summer Boat Talk column, and this week, we beg our lake-faring readers to be on the lookout for potentially hull-piercing debris reportedly showing up in West Michigan waterways. Fednav Ltd., Canada’s leading international maritime bulk carrier, is adding six new 34,000-tonne vessels to its fleet. They will operate in the St. Lawrence Seaway region and be equipped for ice navigation.